The first strand of this project is the search for U Dhammaloka (?Laurence Carroll?, ?1856 – ?1913), an Irish-born migrant worker and activist Buddhist monk (ordained in Rangoon, 1900) who became a leading figure in the Buddhist Revival in Burma, present-day Singapore and Malaysia and Thailand and was also active in Ceylon, India, Cambodia, Australia and Japan (perhaps in Nepal and China too), preaching an anti-missionary message which was readily decoded as anti-colonial sedition and drew on radical western atheist arguments. – While there are a number of birth, census and immigration records which may refer to the man who became Dhammaloka as he travelled from Dublin across the Atlantic and eventually to California (which are points we consider well-corroborated by other data), none of these identifications is as yet certain, including most crucially his birth name, which was probably (but not definitely) Laurence Carroll or O’Rourke. – The use of multiple names may not be so suspicious in itself for someone who had been a hobo and frequently confronted authority, but it needs to be combined with the fact that we have no hard information for a period covering perhaps as much as 28 years of his life, between the earliest time he could have crossed the US and the time he was ordained in Rangoon. For someone who was later clearly incapable of staying out of the limelight more than briefly, this long gap needs explanation. – One intriguing suggestion is that it may be explained by a period of political activism, which would also explain where his evident organising skills as a monk came from, and (perhaps) his anti-colonial sympathies. This period was marked by the rise of the Fenians (IRB), socialism and anarchism, and hard-fought unionising struggles, with harsh repression and underground organisations – as well as the freethinking (atheist) groups which he was later in contact with. – Alternatively, if he travelled relatively early to Asia (in the 1870s or 1880s), it is even harder to explain why such an outspoken individual remains “hidden from history”, and this forces us to look among the great numbers of “poor whites” in countries like India and Ceylon. Was he a sailor, “beach-comber”, pearl fisher, Salvation Army preacher, deserted soldier, or what? And if he lived in Asia for decades, why did nobody recognise him once he was a touring monk? 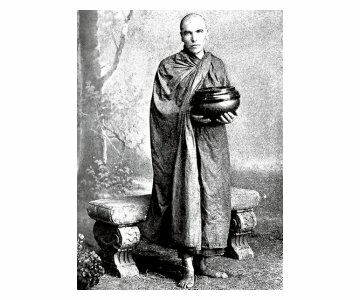 – As a monk from 1900 on, Dhammaloka had frequent brushes with the law: a minor but highly public conviction in 1901 and again in 1911 in Burma, an apparent attempt to harass him on minor charges while touring Australia in 1912, and more determined efforts to keep him under surveillance or prevent him speaking in Ceylon in 1909. Did the police know or suspect something that we do not, and does this explain why he used the implausible alias William Colvin when dealing with the authorities? – Someone (almost certainly Dhammaloka) wrote a letter describing his death in Australia in 1912. Shortly thereafter, he reappeared and debunked the story. Was he simply having fun? Did he make a serious attempt to disappear? We do not know (yet). – Where and when did he actually die? For someone who was constantly in the public, media and police eye, Dhammaloka’s fading out of history around 1913 is mysterious, to say the least. Did he die somewhere remote, perhaps in a rural monastery? Did he change his name once again and disappear after 13 or so years as a monk? Did he die after WWI broke out in August 1914? At present (spring 2013) Laurence Cox is trying to locate relevant material from Dhammaloka’s past in Ireland and the UK; Rachel Pisani is searching for traces of his hobo life on the East Coast, Chicago area and West Coast of the USA; and Mihirini Sirisena is following up his activities in Sri Lanka and India. Our hope is that as with previous research, some of this will turn up evidence as to the missing years of his life and the missing explanations. The search for Dhammaloka also points us to a rethinking of early western Buddhists in Asia, and has drawn our attention to many hitherto ignored figures, particularly but not only plebeian or even “beachcomber” western converts, and their political role in the wider Buddhist Revival. Along with this, Dhammaloka is a window into the history of Buddhism and Ireland, a long and complex story of the changing relationships between Ireland and Buddhist Asia over the centuries. This section of the website links to existing publications (online and print) research on Dhammaloka; Dhammaloka-related public events past and forthcoming; and eventually progress reports from the search for Dhammaloka. Laurence Cox, "Buddhism and Ireland: from the Celts to the counter-culture and beyond". Sheffield: Equinox 2013. Reviews available on Dublin Review of Books (Tadhg Foley), Journal of Global Buddhism (John L. Murphy), Interface (Eilis Ward), Journal of Contemporary Religion (Oliver Scharbrodt), Buddhist Studies Review (Natasha Mikles), Australasian Journal of Irish Studies (Carole Cusack) and Carte Scoperte (Roberto Bertoni).